A woman who was named Miss Bikini Universe Singapore 2018 was stripped of her crown on Sunday (Oct 7) for "breaching" the event's terms and conditions, the organiser said. Feline Wong snagged the title at the beauty pageant that was held at AJ Hackett on Sentosa Island on Sep 15. To have her title taken away from her barely a month after winning obviously came as a surprise to Feline who took to Facebook with her side of the story. In her first post on Oct 7, she confirmed that she had been stripped of her title and thanked her friends for their concern. 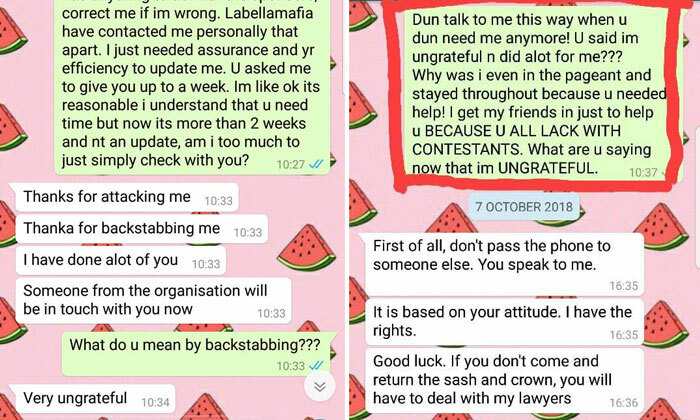 She also alleged that she was stripped of her title because the organiser was offended when she asked for updates on the prize and thus decided to "de-crown" her. Understandably, she was disappointed with the outcome after putting so much effort into the competition. 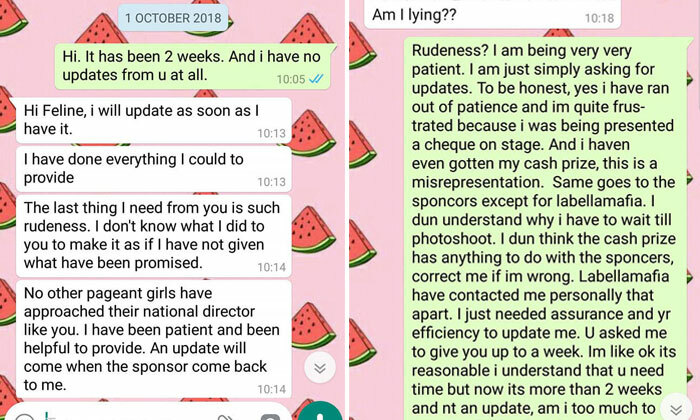 "They decided to strip me of my title just because the event organiser was unhappy that I asked for updates about the prize that I am entitled to and said that I am rude for doing so!" she wrote in her post. 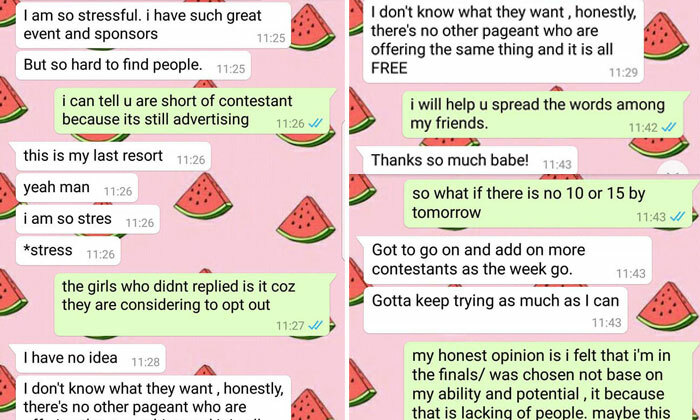 Initially, she censored screenshots of a text conversation she had with a representative of the pageant but in an updated post on Tuesday (Oct 9) she uploaded the original texts. From the texts, the representative accused Feline of being rude after she had asked for updates on Oct 1. The other person also accused Feline of "attacking" and "backstabbing" before calling Feline "very ungrateful". 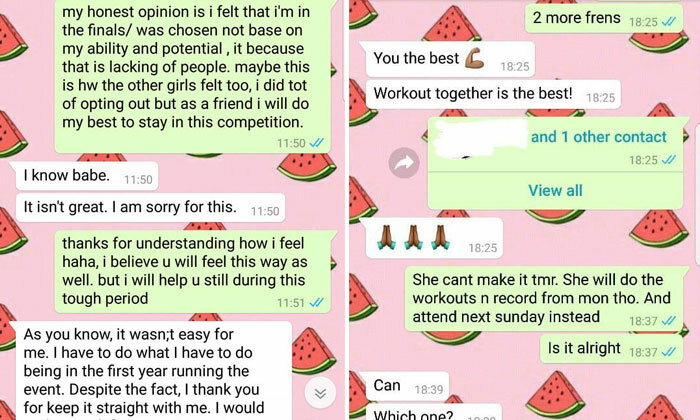 The screenshots also revealed that Feline was friends with this staff member and had actually done her a favour by joining the pageant as it appeared that she was having trouble finding contestants. From an earlier conversation, her "friend" was grateful to Feline for spreading the word and for roping two other friends in as well. Feline also included a copy of a letter she received from Miss Bikini Universe Singapore, spelling out the three rules she had allegedly breached. The contestant is not allowed to make slanderous statements against the organiser, staff, judges, hosts, sponsors, other contestants or any other individuals associated with the event. Defamatory remarks made against the relevant management and team will result in disqualification from the event with immediate effect. She will also forfeit any titles and all prizes previously won without refund and face possible legal charges as deemed necessary by the organiser. The contestant will discuss with the organisers any concerns regarding the rules, regulations, policies and all other matters relating to the event. The contestant is not allowed to interact with other sponsors aforementioned during the event without prior permission. Although she received a cheque board with $1,000 written on it when she was crowned, Feline wrote in her post that she has still not been paid yet. On Tuesday at about 12.06pm, the organiser announced on their Facebook page that the title of Miss Bikini Universe Singapore 2018 has been passed on to 20-year-old Andrea Wong who was initially the first runner-up. It added that Andrea will receive her cash prize of $1,000 after representing Singapore at the international Miss Bikini Universe pageant in China in July next year.